Scene inside a polling station during the French presidential election of 2007: election officials and a standard transparent ballot box. France is a representative democracy. Public officials in the legislative and executive branches are either elected by the citizens (directly or indirectly) or appointed by elected officials. Referendums may also be called to consult the French citizenry directly on a particular question, especially one which concerns amendment to the Constitution. France elects on its national level a head of state – the president – and a legislature. The president is elected for a five-year term (previously, seven years), directly by the citizens. The Parliament (Parlement) has two chambers. 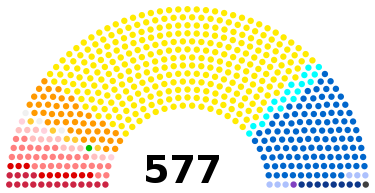 The National Assembly (Assemblée Nationale) has 577 members, elected for a five-year term in single seat-constituencies directly by the citizens. The Senate (Sénat) has 348 members, elected for six-year terms. 328 members are elected by an electoral college consisting of elected representatives from each of 96 departments in metropolitan France, 8 of which are elected from other dependencies, and 12 of which are elected by the French Assembly of French Citizens Abroad (Assemblée des Français de l'étranger) which has replaced the High Council of French Citizens Abroad (Conseil Supérieur des Français de l'Étranger) a 155-member assembly elected by citizens living abroad. In addition, French citizens elect a variety of local governments. There also are public elections for some non-political positions, such as those for the judges of courts administering labour law (conseils de prud'hommes), elected by workers and employers, or those for judges administering cases of rural land leases. France does not have a fully-fledged two-party system; that is, a system where, though many political parties may exist, only two parties are relevant to the dynamics of power. However French politics has ordinarily displayed some tendencies characterizing a two-party system in which power alternates between relatively stable coalitions, each being led by a major party: on the left, the Socialist Party, on the right, Les Républicains and its predecessors. This pattern was upset in 2017, when neither of those parties' candidates reached the second round of the presidential election and the newly-formed party En Marche! gained both the presidency and a comfortable majority in the National Assembly. 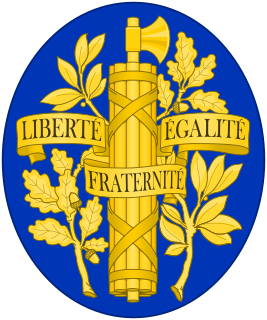 Elections are conducted according to rules set down in the Constitution of France, organisational laws (lois organiques), and the electoral code. Voting is not compulsory. Elections are held on Sundays. The campaigns end at midnight the Friday before the election; then, on election Sunday, by law, no polls can be published, no electoral publication and broadcasts can be made. The voting stations open at 8 am and close at 6 pm in small towns or at 8 pm in cities, depending on prefectoral decisions. By law, publication of results or estimates is prohibited prior to that time; such results are however often available from the media of e.g. Belgium and Switzerland, or from foreign Internet sites, prior to that time. The first estimate of the results are thus known at Sunday, 8pm, Paris time; one consequence is that voters in e.g. French Guiana, Martinique and Guadeloupe knew the probable results of elections before polling booths close. It has been alleged that this discourages voting in these places. For this reason, since the 2000s,[when?] elections in French possessions in the Americas, as well as embassies and consulates there, are held on Saturdays as a special exemption. The next election will take place in 2022. Current President Emmanuel Macron is eligible for re-election in that year. Standard transparent ballot box used in France. The voter puts the envelope containing the name or the list of people for whom he or she votes and then signs the electoral roll to avoid double votes. Some French cities use voting machines. With the exception of senatorial election, for which there is an electoral college, the voters are French citizens over the age of 18 registered on the electoral rolls. People are automatically registered on reaching the age of 18. For municipal and European, but not national elections, citizens aged 18 or older of other European Union countries may vote in France. Registration is not compulsory, but the absence of registration precludes the possibility of voting. Citizens may register either in their place of residence or in a place where they have been on the roll of taxpayers for local taxes for at least 5 years, but not in more than one place. Citizens living abroad may register at the consulate responsible for the region in which they live. Only citizens legally registered as voters can run for public office. There are exceptions to the above rules. Convicted criminals may be deprived of their civic rights, which include the right to vote, for a certain period of time depending on the crime. In particular, elected officials who have abused public funds may be deprived of the right to run for national public office for as long as 10 years. The application of such rules in the case of certain politicians has been controversial; see for instance the case of Alain Juppé. 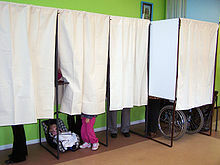 Voting by proxy is possible when the citizen cannot easily attend the polling station (reasons include: health problems, the citizen does not live in the voting constituency, he or she is away for work or vacations, he or she is jailed but has not yet been sentenced and deprived of civic rights etc.) The citizen designates a proxy, who must be a voter from the same commune. The designation of the proxy must be made before a legally capable witness: a judge, a judicial clerk, or an officier of judicial police, or, outside France, before an ambassador or consul. In the case of handicapped or severely ill people, an officer of judicial police or delegate thereof can be sent to the home of the citizen to witness the designation. The procedure is meant to avoid pressures on voters. In all elections where there is a single official to be elected for a given area, including the two major national elections (the election of the President of the Republic and the election of the members of the National Assembly), two-round runoff voting is used. For elections to the European Parliament and some local elections, proportional voting is used. Primary elections, within registered political parties, are used to select presidential candidates for the general election. Primaries also use two-round runoff voting when there are multiple candidates within a party. (see Category:Primary elections in France). Open primaries, where any eligible voter may participate with minimal requirements, also occur. In general, voting is done using paper and manual counting. The voter gets a pre-printed ballot paper (bulletin) from a table at the entrance of the voting office (they are also provided through the mail), as well as an envelope. The voter enters a curtained booth (isoloir), where they are hidden from sight, and inserts the completed ballot paper into an envelope. They walk to the ballot box and may show their voter registration card (not compulsory) and are required to prove their identity (in conurbations with more than 5000 inhabitants, an identification document must be shown). After the officials have acknowledged their right to vote, the ballot box is opened and the voter inserts the envelope. One of the officials, traditionally loudly, announces "A voté! (Has voted!)". This is purely ceremonial and has a double meaning: the voter's voix (voice) will be taken into account and they have accomplished their civic duty. The voter then signs the voters' list and their voter registration card is stamped. Procedures differ when electronic voting is used. It is not widespread in France, but is used in some cities, despite controversy over its safety and effectiveness. As well as Presidential and legislative elections, France also has municipal, cantonal, regional, European, and (indirect) Senatorial elections. Regional elections have been held since 1986 to elect regional councillors and regional presidents: all elected to serve 6-year terms. Elections for the French delegation to the European parliament are held every five years. French senators are renewed by halves every six years through an indirect electoral college composed of elected officials and general, regional, and some local councillors. Municipal elections to elect city mayors and councillors are held every six years. The President may, on the recommendation from the Government or the Parliament, submit to a referendum some government bills. A referendum may be held upon the initiative of one fifth of the Members of Parliament, supported by one tenth of the registered voters. The Constitution explicitly states that a referendum can be called only on a Government Bill "which deals with the organization of the public authorities, or with reforms relating to the economic or social policy of the Nation, and to the public services contributing thereto, or which provides for authorization to ratify a treaty which, although not contrary to the Constitution, would affect the functioning of the institutions" (Article 11 of the Constitution). if the proposal fails on a referendum, it cannot be re-submitted to a referendum for next two years. The second procedure for holding a referendum was added to the Constitution in 2008, and it still has not come into effect (as of 2013). It will come into effect when appropriate legislation is implemented by the Parliament. by three fifths super-majority of both houses of the Parliament. Most constitutional revisions went through the super-majority of the Parliament in Congress. Ratification of treaties of accession of states to the EU must go through the same procedure as amendment of Constitution of France. All of ratifications went through the super-majority of the Parliament, except the first EU enlargement in 1973. ^ "Electoral code, article L55" (in French). Legifrance.gouv.fr. 27 October 1964. Retrieved 6 May 2012. ^ "Electoral code, article R26" (in French). Legifrance.gouv.fr. 27 October 1964. Retrieved 6 May 2012. ^ "Electoral code, article L49" (in French). Legifrance.gouv.fr. Retrieved 6 May 2012. ^ a b "Constitution". French National Assembly. Retrieved 2 November 2013. In political science, an initiative is a means by which a petition signed by a certain minimum number of registered voters can force a public vote in parliament called an indirect initiative or via a direct initiative, the latter then being dubbed a Popular initiated Referendum. 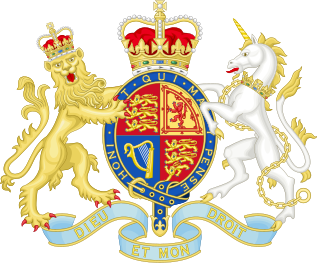 The Electoral Commission is an independent body set up by the UK Parliament. It regulates party and election finance and sets standards for well-run elections. Elections in the United States are held for government officials at the federal, state, and local levels. At the federal level, the nation's head of state, the President, is elected indirectly by the people of each state, through an Electoral College. Today, these electors almost always vote with the popular vote of their state. All members of the federal legislature, the Congress, are directly elected by the people of each state. There are many elected offices at state level, each state having at least an elective Governor and legislature. There are also elected offices at the local level, in counties, cities, towns, townships, boroughs, and villages. According to a study by political scientist Jennifer Lawless, there were 519,682 elected officials in the United States as of 2012. Romania elects on a national level a head of state – the president – and a legislature. The president is elected for a five-year term by the people. The Romanian Parliament has two chambers. The Chamber of Deputies has currently 329 members, elected for a four-year term by party-list proportional representation on closed lists. The Senate (Senatul) has currently 136 members, elected for a four-year term by party-list proportional representation on closed lists. Elections in Barbados is the process of conducting general elections or by-elections and formulating election results in Barbados. An election is a process in which a vote is held to democratically elect national candidates to an office. In the case of Barbados, it is the mechanism by which the electors choose members to fill elective offices in the House of Assembly. Elections are held on Election Day. These general elections do not have fixed dates, but must be called within five years of the opening of parliament following the last election. A former minister of the DLP, Warwick Franklin summed up the general elections process in Barbados as saying it is really just, "30 by-elections on the same day." Elections in Belgium are organised for legislative bodies only, and not for executive functions. Direct elections take place for the European Parliament, the bicameral Federal Parliament, the Parliaments of the Communities and Regions, the provincial councils, the municipal councils and a few district councils. Voting is mandatory and all elections use proportional representation which in general requires coalition governments. Elections in Bhutan are conducted at national (Parliamentary) and local levels. Suffrage is universal for citizens 18 and over, and under applicable election laws. In national elections, political party participation is mainly restricted to the lower house of Parliament, and by extension, to the executive nominated by its majority. Elections in Portugal gives information on election and election results in Portugal. There are six types of elections in the United Kingdom: elections to the House of Commons of the United Kingdom, elections to devolved parliaments and assemblies, elections to the European Parliament, local elections, mayoral elections and Police and Crime Commissioner elections. Within each of those categories, there may be by-elections as well as general elections. Elections are held on Election Day, which is conventionally a Thursday. Since the passing of the Fixed-term Parliaments Act 2011 for general elections, all six types of elections are held after fixed periods, though early elections to parliament and the devolved assemblies and parliaments can occur in certain situations. Currently, six electoral systems are used: the single member plurality system, the multi member plurality system, party-list proportional representation, the single transferable vote, the additional member system and the supplementary vote. Municipal elections in France allow the people to elect members of the City Council in each commune. These are called conseillers municipaux. They elect the mayor, who chairs the city council, as well as Deputies to the Mayor. The term of office of councilors, the mayor and his deputies is, in principle, six years.